Happy December! It’s the month of cozy snuggling up in your warm hand knits… while frantically last-minute gift knitting! 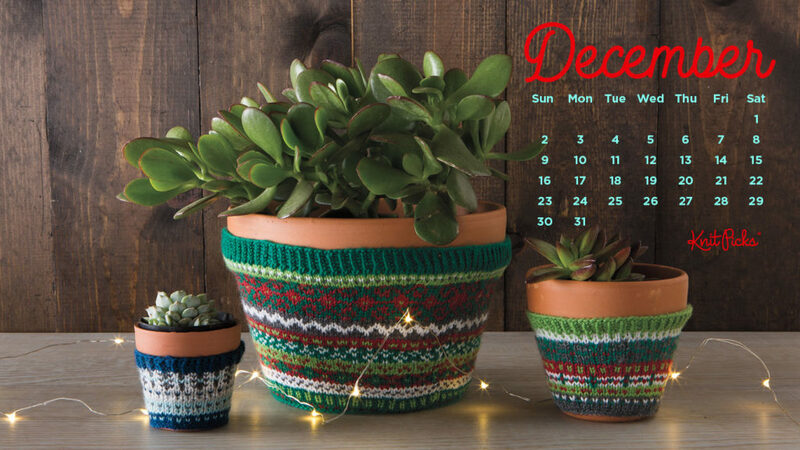 We hope you started early and aren’t too overwhelmed with gifts yet to be made, but perhaps the smaller of these sweet Plant Cozies is a good option for a quick project. The pattern is by SpillyJane and is offered as a free pattern, our gift to you, along with these calendar wallpaper downloads! To get the December 2018 calendar background of your choosing (smart phones, tablets or desktop computers), simply click the applicable device icon below. Enjoy! Love this one. I totally missed last months. This one is especially nice on my phone. Can someone please tell me how to download this calendar onto my IPad so that it is my home screen? Thank you. If you save the image to your iPad photo library you should be able to set it as your home screen.